In 2009 we now take it for granted that men and women have equal rights and opportunities to participate in all aspects of society. During the last century the emancipation of women was a series of long hard fought struggles. Not the least of these was the provision for women of effective methods of family planning which allowed them to emerge from the “tyrannies of excessive fertility”. 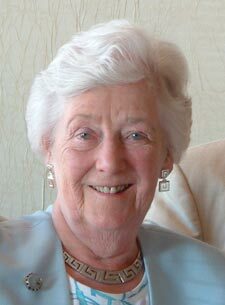 Nancy Loudon who died in Edinburgh on the 20th February 2009 was one of the second generation of pioneers who provided the family planning services which as part of the NHS were available to all women irrespective of economic or social circumstances. Nancy was eldest daughter of Alec and Helen Mann, a well known farming family in the Black Isle. A traditional Scottish education provided her with the qualifications to study medicine at Edinburgh where she graduated with honours in 1949. She took up a resident post in the Simpson with Professor RJ Kellar where she met her future husband John Loudon. Unbelievable as it seems today when over 50% of junior obstetric doctors are women she was instructed to resign her post on becoming married. Clearly things have changed in the last 50 years! While John continued in obstetrics to become a distinguished senior consultant at the Royal Infirmary and then the Eastern General Hospital, Nancy turned her talents and energy to family planning. She played a pivotal role in establishing a comprehensive service initially under the auspices of the Family Planning Association and later in 1974 as part of the NHS. Her clinic in Dean Terrace was a prototype of what was to become the subspecialty of Sexual and Reproductive Health. Never afraid to challenge the establishment she expanded the service beyond family planning to include menopause, colposcopy, cervical screening and psychosexual counselling . Dean Terrace became a centre for national and international research and teaching. She was author and co-author on over 70 publications including the results of prospective study of women attending family planning clinics (Oxford FPA Study) which defined the long term effects on health and disease of the oral contraceptive pill. In 1985 she edited the First Edition of what has become the gold standard textbook “Handbook of Family Planning” The 5th edition edited by the present Director Anna Glasier and Nancy’s daughter in law Ailsa Gebbie was recently published. Her services to national committees and colleges were recognized by the award of OBE and locally in Edinburgh by the Sir William Y Darling Award for Good Citizenship in 1989. Nancy was an enthusiast. Nothing was impossible. Long after she officially retired from Dean Terrace she played an active role in the developments of the service which she had started. She will be remembered for all she achieved in improving the lives of women.